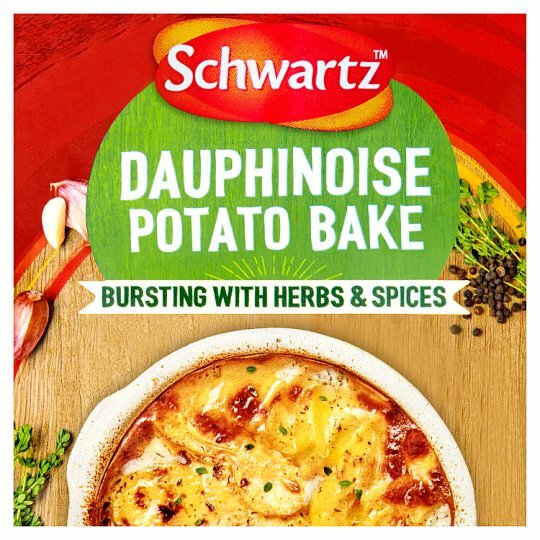 A rich and creamy recipe mix with aromatic thyme and sweet garlic for a mouth-watering potato bake full of flavour. 2. Mix the sachet contents with the milk and bring to the boil, stirring. Simmer for 1-2 minutes, until smooth and thickened, stirring continuously. 3. Layer the potatoes in an ovenproof dish and pour over the sauce. Cook in the oven for 1 1/2 hours, until the potatoes are cooked through and golden. Delicious topped with grated Cheddar cheese before baking. Try replacing half the potato with sweet potato or adding sliced red onions.